Large study reveals how the majority of people can reduced their consumption of sugar, fat, sodium and total daily calorie intake. Tap water is a simple and effective solution for those who want to reduce their calorie intakes and control their weight in a healthy way. Increasing the drinking of plain water even by only 1 per cent can reduce the level of sugar, fat, sodium and total daily calorie intake. Plain water includes tap water, water from a cooler, bottle or a fountain. 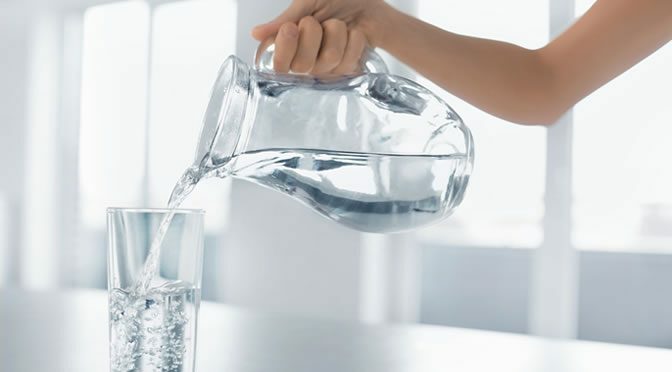 In this study people’s total energy intake was reduced by 68 to 205 calories daily when their water intake increased by one, two or three cups per day. Their daily sodium intake was reduced by 78 to 238 milligrams; consumption of sugar was 5 grams to 18 grams less and their cholesterol intake was also reduced by 7 to 21 milligrams. “The impact of plain water intake on diet was similar across race/ethnicity, education and income levels and body weight status. In the study participants recorded everything they drank or ate. Beverages such as herbal tea, coffee and black tea were not counted as plain water, but their water content percentages were calculated. Subjects drank 4.2 cups of plain water, on average, every day. This was more than 30% of their total dietary water intake. The average calorie intake for each individual was 2,157 calories, including 432 calories from discretionary foods and 125 calories from sugar-sweetened drinks. Discretionary foods are high in calories but low in nutrients. Examples include snacks, pastries and desserts. In addition, along with reduced consumption of sodium, sugar, fat and cholesterol, participants’ intake was decreased in discretionary foods and sugary drinks. This study was published in Journal of Human Nutrition and Dietetics (An & McCaffrey, 2016). Drink Water: Does It Have To Be 8 Glasses A Day?